Have the archaeologists reached the ancient city of Lidoma, mentioned in historical plates? Payvand.com - In the second round of excavations in the historical site of Achaemenid region in Noorabad, Mamasani, of Fars province in Southern Iran, a restricted amount of remains of a columned balcony and a hall and its stairway, were discovered; this is one of the ten largest buildings having a structure similar to Persepolis. According to the cultural heritage reporter of ISNA (Iranian Students' News Agency), the Iranian chief of the excavation site in this area, confirming the above news, said: The excavations have been going on from Dey (January) and has reached a balcony and a hall and stairway belonging to a large building. 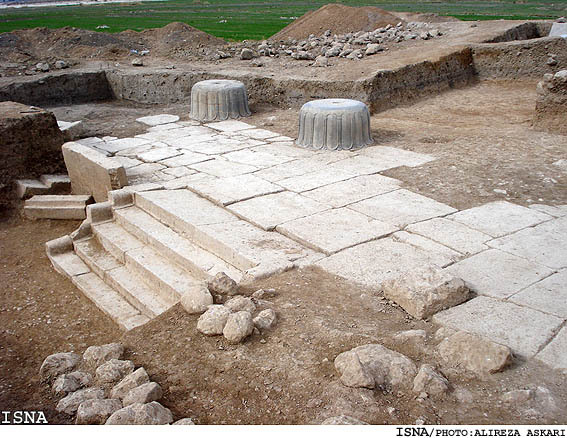 He added: This Achaemenid building has huge columns with a base about one meter thick. The styles of columns are the same as the Persepolis columns. The dimensions are similar to columns of Hall of Hundred Columns of Persepolis. According to this report, there are traces of lotus flowers on the base of columns and the colour of the columns are the same as the Persepolis columns. He pointed out to the fact that the discovery of this building has created several questions and said: The exact date of Achaemenid period in which the building was erected is not yet clear. The building could be one of the buildings of the famous Lidoma city, which has been mentioned in Persepolis plates. The excavations in this are is carried out under the supervision of Ali Reza Asgari, from the archaeology research centre and Daniel Thomas Pats from the Australian Sydney University. The joint team of Iranian archaeology research centre and the Australian Sydney University, began the excavations from 1381  in Mamasani region in Fars province. The outcome of excavations of this stage is the discovery of 51 historical sites in Rostam 1and 2 plains, 25 historical plates in Noorabad and 16 other in Espid hills. The dates were verified by radioactive process and give valuable information regarding the settlements in the sixth millennium BC to year 50 in this region. Asgari said: The second phase of excavations started in 2007 and was planned to continue the explorations done in the previous stage. He added: At this stage the excavations were concentrated in Achaemenid historical zones. These zones have different names such as Qal'e Koli, Servan, and Jinjan. The discoveries in this region open the path to an understanding of the Achaemenid studies in South and South-West Iran. Hertzfeld first discovered this area in 1924 and called it Jinjan. In 1935, Stein, mentions the villages in this region by the name Jinjan. 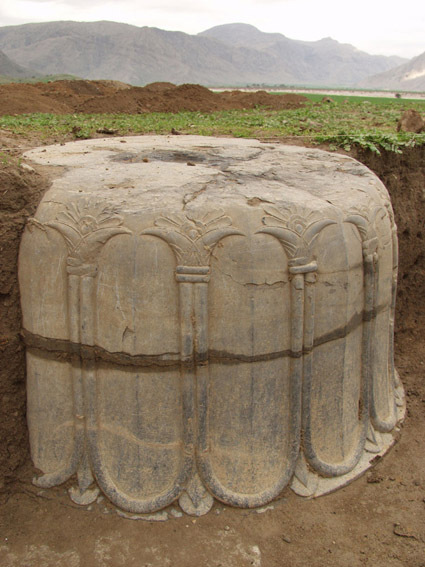 The first excavations in this area were carried out by an Iranian-Japanese archaeological team in 1959, during which a column-base coloured in grey was found, having lotus figures on its top. Asgari pointed out that the remains of a large building with columns in this region, along with numerous stone made pots, similar to those found in Persepolis area suggest that maybe as Herodotus has said, the king's road passed by this area. Or as Hertzfeld and Stein suggest this area could have been a caravanserai in the kings' road towards Shush. Some have also suggested that this place could have been a depot for collecting and storing the tax of the region. 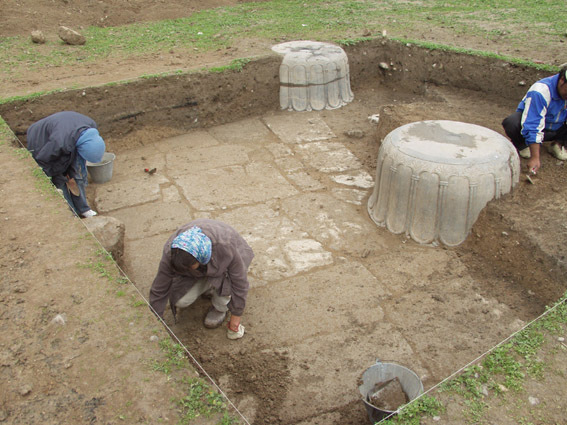 The Iranian supervisor of the archaeology team insisted: Although it is speculated that the functions of this place is similar to that of a region called Borazjan, but it is too early to conclude anything about the Jinjan region. It is true that large collection depots were numerous in this region, including the one in Borazjan, but more studies should be carried out in Jinjan region. He corrected his last year statements according to which he had said that the building discovered in this region was the fourth in its kind and said: Considering the building discovered from the Achaemenid period, this is the tenth building of its kind which belongs to this period.